A couple of months ago, I began to notice a curious looking circular device showing up regularly in the photos of a bunch of yoga practitioners I follow on Instagram. Sometimes it was just sitting there in the background; other times it was used as a backbend tool/support. Curious (especially since backbends are the category of pose that tend to be most challenging for me), I decided to do a little internet sleuthing to find out what this magical backbend-enhancing apparatus was. Turns out it's the Dharma Yoga Wheel, and turns out it's everywhere. So much so that even celebrities have been Instagraming their wheel-inclusive asana practices. And even if you're not into Instagram (or late '90s pop stars), you might have noticed a yoga wheel or two showing up at workshops, festivals, or even in class. Heck, there's even a DYW teacher training in the works. But the trend factor aside, what's the deal with the wheel? Can it really strengthen and support your backbend practice? And can you use it for other types of poses as well? Wait, what exactly is a yoga wheel? 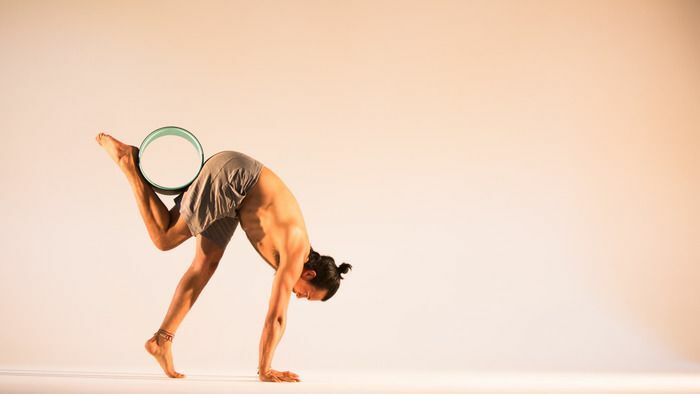 The Dharma Yoga Wheel is the brainchild of Sri Dharma Mittra and his son, Yogi Varuna. (Thanks to its popularity, similar devices such as the Breakin' a Sweat Yoga Wheel and the Yoga-Yogi Wheel have since emerged.) 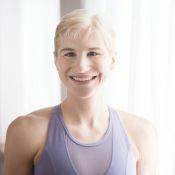 Though the DYW has gone through a few different incarnations, right now practitioners can choose between the “basic” size wheel, the “mini” (recommended for practitioners under five feet tall), and the “plus” (recommended for practitioners over six feet tall or those who would like to explore “deeper” stretches). Wheels are priced at $99 (basic or mini) or $109 (plus). According to their website, the DYW can be used tons of different ways, and offers a myriad of benefits, including back/shoulder/chest opening and quad/hip flexor stretching. It's also been touted as a balance-enhancer and a tool for making challenging backbends and arm balances more accessible. But does it “work”? Is it worth the hundred dollar price tag? I, along with Yoga International graphic designer Jake White (who was kind enough to model for this article), decided to find out. Here's what we discovered (so far) when we took the Dharma Yoga Wheel for a spin. Alright, I know. It's just a plastic wheel. A plastic wheel that you hold onto or place under your back to make backbends deeper or more accessible. And if you regularly practice backbends you might think, “Instructions? Who needs those?” I thought that too initially, only to find out that the just-under-six-minute tutorial on the Dharma Yoga Wheel's Youtube channel is actually pretty useful. It includes variations of poses like bridge, dvipada viparitta dandasana (two-footed inverted staff pose), and—what I was personally most stoked about—kapotasana! (full pigeon pose, demonstrated below by Jake). You see, full pigeon is a pose that I've struggled with for a long time. I may or may not have referred to it as my “arch nemesis.” (Get it? Backbend? Arch?) 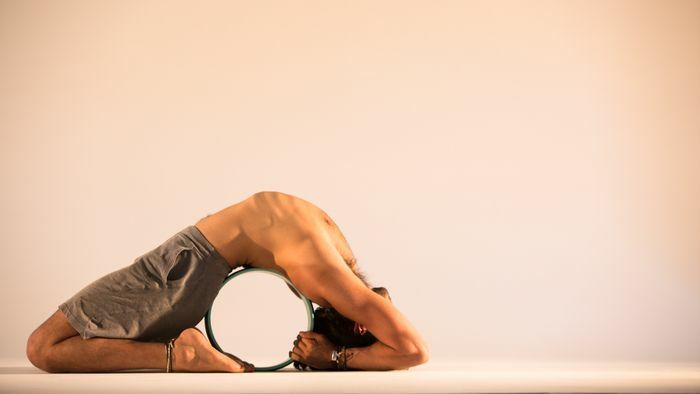 When I first spotted the wheel on Instagram, I noticed a lot of supported kapotasanas, and as I awaited the arrival of the wheel, I eagerly anticipated that it would help make this challenging pose more doable for me. Only when I first tried it (initially coming into the pose via camel, as I normally would, with the wheel behind me), it was actually harder—harder! Frustrated, I was ready to admit pigeon defeat, until I fortunately came upon the aforementioned tutorial. 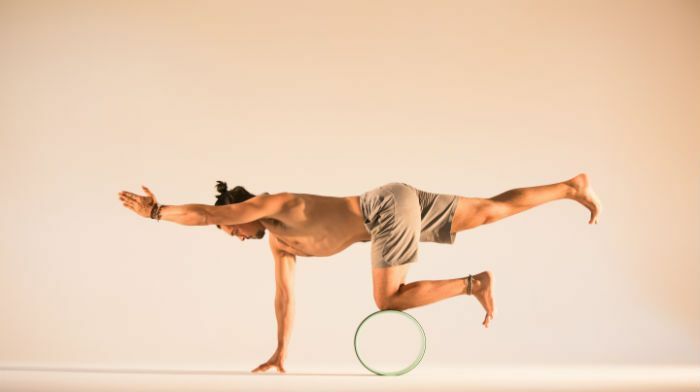 It offered what I found to be a much more accessible approach to entering a wheel-enhanced pigeon (from a supported supta virasana), and a handy tip about holding below the opposite elbow (to help you catch hold of the wheel). For the first time in my life, I was able to do a version of full pigeon! And it was actually pretty comfortable too. 2. It's a great tool for practicing forearmstands. Plus, we both discovered that when it comes to backbendy forearmstands like vrischikasana (scorpion pose) and hollowbacks, the wheel can be especially useful. In fact, with the wheel, Jake was able to comfortably bring his feet to his head for the very first time in scorpion. “I could find a deeper backbend because I had the 'pull on the wheel' factor and my feet pressing on the wheel to counterbalance. So I could really pull my chest through while still remaining stable” he says. Note that this does actually require feet-to-wheel contact, something that I'm personally not able to do yet. Still, I found that holding onto the wheel helped me to feel more confident and stable in my pincha mayurasanas and hollowbacks. Make sure you hold onto the side of the wheel that's closest to you. If you hold onto the side that's furthest away, and you overshoot and end up in a backbend, you'll be rolling over your hands, which is not super-pleasant (trust me, I speak from experience here!). And while the DYW is a neat tool, it's no substitute for a skilled teacher. When it comes to poses like forearmstand (or any pose that's new to you or that you're just unsure about), talk to your teacher before attempting (with or without the wheel). 3. Where this prop really shines? Making challenging backbends more accessible. While it's not only for backbending, if you ask me, the DYW really shines when it comes to making challenging backbends more accessible. 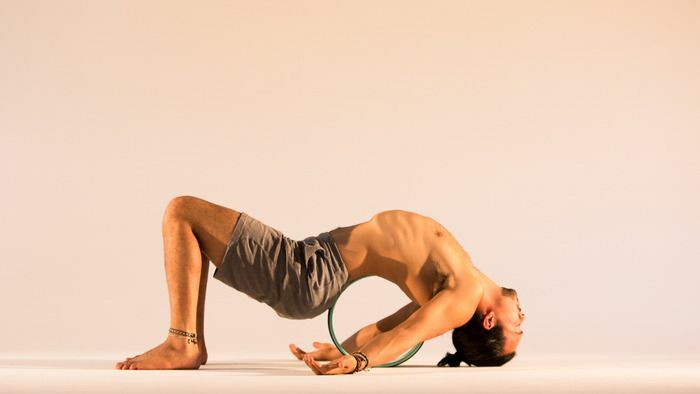 While “challenging backbend” can mean all sorts of things depending on the practitioner and their individual practice and body proportions, the wheel is a useful preparatory tool and prop for all kinds of backbends—from bridge pose to full pigeon, to everything in between. In fact, the first time I lay back over the wheel I couldn't help but notice that I was practically in urdhva dhanurasana (upward bow pose). One of my favorite ways to teach urdhva dhanurasana is to prep students with three yoga blocks—two blocks at their lowest height stacked horizontally underneath the shoulder blades, with the other block horizontally at its lowest height supporting the head. From here, the student is already “halfway there,” and pressing up into urdhva can seem less daunting. I could easily see how a yoga wheel could serve a similar purpose (though to be fair, it comes with a much heftier price tag than the three blocks). All in all, the wheel can both provide you with a great way to prepare for backbends (rolling, practicing simple supported shapes), as well as some sweet support when working into poses you find more challenging. 4. It may trick you into some core work. 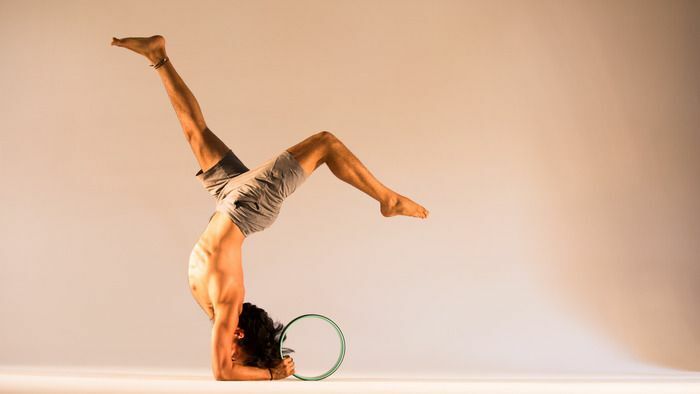 So we've clearly established that yoga wheels can be pretty useful when it comes to backbends. But what about non-backbendy poses? 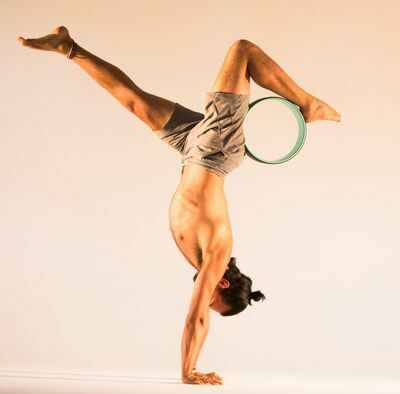 While a quick Instagram search (#DharmaYogaWheel) will provide examples of all sorts of asanas, admittedly it sometimes seems that the prop is just there to “be there,” as opposed to actually supporting or enhancing a pose in some way. Still, aside from backbends, the DYW is also pretty boss when it comes to sneaking in some extra core stabilization. 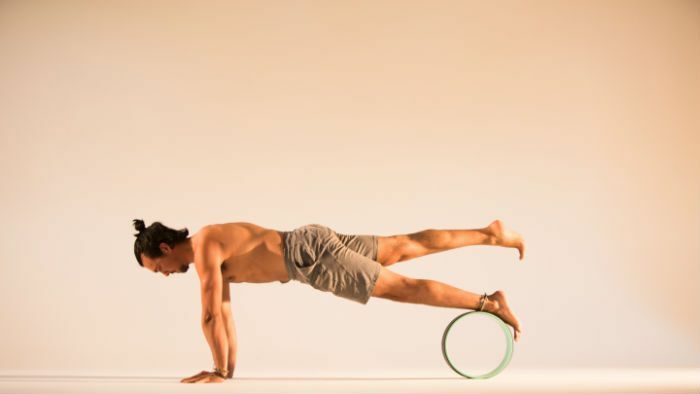 Whilst experimenting with the wheel, Jake and I both found that incorporating it into balance poses—opposite arm/leg extension, planks, standing balance poses, even mountain pose (way harder than it might sound when the DYW is involved, by the way)—was a great way to add in some extra challenge and core stability. 5. It's also pretty great for learning to press up into handstand. The more we collaborated and experimented with the wheel, the more we figured out new and interesting ways to incorporate it into our favorite (and not so favorite) poses. And some of them were, honestly, pretty useful. Like take handstand-press, for example, a transition that Jake and I are both working on, and both find pretty challenging. Jake discovered that if he practiced while hugging the wheel with one leg, between thigh and calf (see image below), pressing up was way more accessible. He explained that squeezing the wheel and drawing it in toward his chest helped him to engage his legs and core more, giving him the power to get his hips up over his shoulders without hopping. So, what's the verdict? Is the yoga wheel really worth it? As I may have mentioned above, this deceptively simple-seeming cylinder is a pretty useful tool to have around when it comes to working with backbends in particular (though it does certainly have other uses). It's versatile enough to be accessible for a variety of skill levels, and teachers may find it especially useful when it comes to working with private clients or small groups (though due to its high price, most students probably won't be asked to “grab a wheel” along with their blocks/straps/blanket in larger classes anytime soon). If it looks intriguing (and you have an extra $100 to spare), then sure, take it for a roll.